Located in the heartland of the United States, the breathtaking Pittsburg State University Veterans Memorial Amphitheater is a heartwarming testimonial to the men and women who served our country. It is a tribute much larger and more professionally conceived and executed than you would expect to find in a Southeastern Kansas town with a population of less than 20,000. Though Pittsburg, KS may be a little off the beaten path, by mid-year this three-year-old memorial will surpass the 100,000 visitor mark. In fact, the PSU Veterans Memorial Amphitheater has attracted the largest number of visitors of any site in the area. And, the visit is free! In the early 1990’s, while university leaders were developing a long-range master facility plan for the campus, Dr. Joseph G. Smoot, then Vice President for Development, suggested the idea of a veterans memorial on campus to honor faculty and students who had served their country. Over 12 years later, on Memorial Day, May 31, 2004, the PSU Veterans Memorial Amphitheater was dedicated and Dr. Smoot’s dream became a reality. It happened not by wishing but by the tireless efforts of PSU Vice President, Dr. James AuBuchon, who served as the university’s project director and coordinator, and thousands of dedicated supporters, contributors and construction professionals. AuBuchon, a retired Army brigadier general, retired from the university staff but remains as Program Director of the Veterans Memorial Amphitheater. Larry Salzman, a former member of the PSU ROTC staff, was a driving force in getting John Devitt, builder of the “Vietnam Moving Wall”, to donate a “Wall” to PSU for permanent display in university’s new memorial. Today, these two Vietnam veterans lead “Friends of the Memorial”, an organization formed to support future programming perpetuate the PSA Memorial as a living tribute. The Crossland Construction Company of Columbus, KS served as general contractor for the project and the Crossland Family was a major memorial contributor. Lead architect J. Samuel Frey, AIA, and his team at Schaefer Johnson Cox Frey Architecture of Wichita, designed this magnificent memorial. SI Veterans Memorial, Parsons, KS, did all of the granite work on the memorial, supplied all the granite memorial pavers and donated the five granite U.S military services seals displayed in the memorial entryway. Construction of the originally designed PSU Veterans Memorial Amphitheater cost $1.3 million and would have cost much more without Devitt’s generous donation of the “Moving Wall” and approximately 3 acres of land donated by the PSU Foundation. Subsequent additional improvements added approximately $430,000, bringing the total cost to over $1.7 million. State of Kansas, Pittsburg State University, and the flag honoring those missing in action. Visitors enter the amphitheater through portals to the left or right side of the rampart wall. Narrow apertures cut into two 20' tall sandblasted concrete entry portals focus the arriving visitor’s attention on each of two original large bronze sculptures created by a Wichita artist, Constance Ernatt. “Peace and Tranquility” features a sculpture of the world with doves encircling it. “Secure the Blessings of Freedom” features an eagle in an aggressive stance, perched on a U.S. flagstaff. One solemnizes peace, the other celebrates freedom. Statues are each approximately 7' tall, mounted on 4' high sandblasted concrete pedestals. Stretching between the two portals as you enter the Memorial Amphitheater is the “Moving Wall”, one of three half-size replicas of the Washington, D.C. Vietnam Veterans Memorial that have been touring the country for almost 20 years. Devitt, who built the Moving Wall with the help of other Vietnam veteran volunteers, refurbished one of the walls and donated it to university for permanent display in the PSU Veterans Memorial. The 300' wall is made of porcelain enameled steel panels with stenciled names. A 12’ wide x 21’8” tall Monumental Arch is the dominant feature of the memorial. An eternal flame, representing the values of selfless service and sacrifice, is centered prominently in a 4' diameter circular window near the top, above the inscription that reads: “PITTSBURG STATE UNIVERSITY HONORS OUR SONS AND DAUGHTERS WHO ANSWERED THE CALL OF THE NATION. WE ARE EVER GRATEFUL FOR THEIR MANY SACRIFICES IN PEACE AND WAR THAT FREEDOM WOULD PREVAIL.” The Monumental Arch is steel reinforced concrete, clad with absolute black granite. The granite cladding is 1¼” thick all polished slabs. Two 4’8” tapering x 40’ long concrete walls flank each side of the Arch. For Memorial Day 2006, the south façade of these walls were enhanced with absolute black granite cladding inscribed with quotes from Abraham Lincoln, Daniel Webster and Shakespeare’s Henry V, Act IV, Scene III. 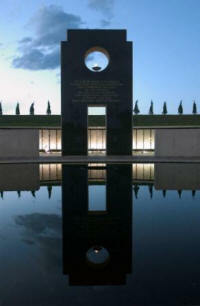 The cladding was comprised of multiple 30” wide panels of 1¼” thick granite, engraved and highlighted in gold. The 40' x 60' Oval Reflection Pool with a 4' diameter hole in the water, a liquid cavitation, is a central feature of the Memorial Amphitheater. As a special commemoration for those who have made the ultimate sacrifice, the hole creates a void within the pond, evoking a sharp awareness that something is missing, something incomplete, reflecting absence. The “Veterans Memorial Walk of Honor”, originally located in the Brock Family Amphitheater Plaza surrounding the reflecting pool of the PSU Veterans Memorial, features engraved granite memorial pavers paying tribute to individual veterans. In 2006, the Walk was expanded to include the Crossland Plaza, just west of the Sutherland Entrance Plaza. The pavers, purchased by family and friends of veterans, now total over 2,750. Proceeds from the paver sales support the ongoing maintenance and upkeep of the PSU Veterans Memorial. The pavers are 3 different sizes (8” x 8” x 2”, 12” x 12” x 2” and 6” x 12” x 2”), all made of sawn Mahogany granite. The 275-seat amphitheater interior is an earthen bowl extensively landscaped to contribute to the serenity of the area. It opens to a plaza which serves as the venue for special events and accommodates individual contemplation. The concrete seating follows the contour of the bowl shape. A display of the 50 state flags is on the north berm of the memorial. The flags were used at the dedication ceremony and later added as a permanent element in the memorial. The entire site is extensively landscaped with many trees to create a park setting evoking a sense of quite and reverence. Eight 8’ wide x 18” deep benches with black granite capped tops are placed though out the complex. An information kiosk was installed prior to Memorial Day 2007. This ATM-style kiosk provides visitors access to a computerized system to look up the location of memorial pavers or names on the Vietnam Moving Wall. Photos of past events held at the Memorial as well as historical information on its funding and design are also available on the kiosk computer. "Crossland Construction was very pleased to be a part of this project,” said Ivan Crossland, Jr., CEO of Crossland Construction. “Our founder, Ivan Crossland Sr., was a Korean War Veteran and we have a great relationship with Pittsburg State University, so this project allowed us to show our respect for both. This memorial serves as a tribute to the men and women who have protected and served our country in the past so we can enjoy freedom today." SI Veteran Memorials and its sister company, SI Construction, have created hundreds of monuments since 1968, including over 20 Korean War Veteran Memorials. Recently, the company completed veteran memorials in Overland Park, KS, and Little Rock, AR, and currently coordinates the pavers fundraising project for the Liberty Memorial in Kansas City, MO, the nation’s only World War I memorial. SI is the preferred provider to the VFW and is working with the American Legion on several projects. Parent company Suhor Industries, Inc., Overland Park, KS, is the nation’s largest burial vault manufacturer and one of the leading funeral service providers in the country. Schaefer Johnson Cox Frey Architecture also designed a memorial at Wichita State University dedicated to those who died on October 2, 1970, when a plane carrying members and coaches of the university’s football team crashed in the Colorado mountain wilderness.